Real People. Real Stories. Real Impact. These brave women are now cancer-free, thanks to you. With 75% of funds raised staying right here in the community, the women you’re helping are your neighbors, your family, your co-workers, your friends. From all of us, thank you for your continued support in the fight against breast cancer. Click on the faces below to read their story! When Christal survived both World Trade Center attacks, she thought she'd seen it all. In 1993, she was working in 4 World Trade Center during the attacks, and in 2001, she was in Tower Two on the 48th floor. Surviving those attacks was nothing short of a miracle. Then, in October 2012, eleven years after the towers fell, Christal was diagnosed with breast cancer. Thanks to a grant funded by you, Christal, at age 62, got her yearly mammogram from Project Renewal's ScanVan. A few days later she got a phone call saying they found a small calcification that hadn't showed up the year before so they wanted to have it biopsied. Mary Solomon from the ScanVan set up her biopsy appointment and sure enough, Christal learned the calcification was cancerous. She was stunned. With no family history and no weird symptoms other than being a bit more tired than usual, she wasn't expecting this. During the double mastectomy, they found cancer in her lymph nodes and breast bone. Christal suffered through chemo and its side effects with her husband Tom by her side. Tom was there through it all, from fighting the hospital bills to letting her have a one-hour pity party every week, and even going to all her treatments. It's almost five years since her diagnosis and treatment, and in January of 2017, Christal was told there is no evidence of cancer in her body. Christal survived two terrorist attacks, and she thrived after a Stage IV diagnosis. Christal is alive today because of the ScanVan's mammogram, NYU Langone's chemotherapy, Staten Island's radiation, and the love and support of her family and friends. Thank you. You made this possible. For most people, birthdays in your 20s are filled with parties, friends, cake, and fun. Jessica spent her 28th birthday in a breast surgeon’s office receiving the diagnosis that would change her life. Happy birthday, Jessica, you have breast cancer. The 28-year-old nursing student had an aggressive form of the disease and no health insurance. Luckily, Jessica found Arlene Allen, RN, Nursing Navigator at the Peconic Bay Medical Center. 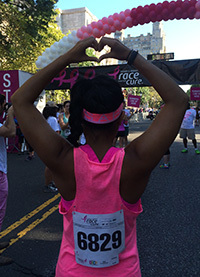 The program, funded by Komen Greater NYC, provides resources for breast cancer survivors. Arlene was Jessica’s resource for medical insurance, rental assistance and education. Without Arlene and the services she provided, Jessica would not have received the cancer treatments she needed to survive. Now 31, happy, healthy and strong, Jessica is in remission, working as a cardiothoracic nurse in Nassau County. It was donors like you who helped her receive the care, treatment, and support that saved her life. Meet Lisa - a wife whose husband lost his job and had a stroke, a mom whose son was diagnosed with autism, and an immigrant diagnosed with breast cancer - all while she and her family lived in a homeless shelter. Her son needed her help. Her husband needed her help. But first, she needed to help herself. Six years later, Lisa is in remission, her husband is in therapy, her son is in fourth grade at a specialized school, and they are living happily in a Staten Island apartment. Without your help, Eddie wouldn’t have a mother, Edward wouldn’t have a wife, and neither of them would have such a strong and amazing caregiver. One year, three mammograms, and an ultrasound later, Alantheia was diagnosed with breast cancer. At the same time, two of her daughters were pregnant. Suddenly, everything she was looking forward to was everything she was going to miss. Alantheia needed to meet her grandchildren. She powered through tons of tests, four lumpectomies, a mastectomy and Tamoxifen, all with the help of two Komen Greater NYC community partners. A social worker also helped Alantheia manage her recovery, transportation, finances, and counseling. Thanks to you and the services your donations provided, Alantheia got the treatments she needed and is a proud grandmother of two beautiful grandbabies today. Before Joy was diagnosed with breast cancer, she’d been a busy vibrant woman. But when a suspicious finding required a biopsy — a biopsy she couldn’t get — Joy’s life depended on getting that test. Through a Susan G. Komen Greater NYC-funded breast health program underwritten by you, Joy was able to get a biopsy and find a fantastic doctor and a patient navigator who would get her through her breast cancer journey successfully. Today Joy is happy, healthy and cancer-free. She cheered her son on at his college graduation, and continues to cheer on the work Komen Greater NYC is doing thanks to your support. Leah was always an avid swimmer. But when she was diagnosed with breast cancer, she felt like she was drowning in a deep ocean, all alone, struggling to keep her head above water. As an immigrant alone in the Big Apple, programs like God’s Love We Deliver meal services and SHARE hotline helped her through her journey. After a lumpectomy with four cycles of chemotherapy, 38 days of radiation and Tamoxifin, Leah was declared cancer-free. Since her clean bill of health, Leah continues to help throughout the community. She participates in any Komen Greater NYC-related activity or event to get the word out about how your donations helped keep her afloat. Leah has even started a dragon boat racing team for women cancer survivors who gain strength and learn from each other rowing, which encourages other survivors to keep moving, as well as to raise awareness and funds to fight breast cancer. Maha, an immigrant from Jordan, was coordinating workshops with Memorial Sloan Kettering Cancer Center for her church. While working, a patient navigator encouraged her to get a mammogram. That advice saved her life; the mammogram detected her breast cancer. Through your donations to Komen Greater NYC, MSKCC’s Arab-American Breast Cancer Education & Referral Program helped Maha find support programs, resolve financial issues, and get employment assistance. After taking a medical interpreting course, she even found a full-time job. Maha has shared her story and the impact of your donations with the Arabic media. Without your help, she would not have known she had breast cancer or had so much help and support to make her journey easier. We are happy to say she’s cancer-free, and continues to support and encourage women through their journeys! To continue to help the women and families in our communities, please donate!